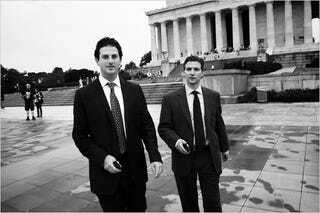 With more Twitter followers than any governmental employee besides Barack Obama and John McCain, Jared Cohen and Alec Ross are the U.S. government's internet gurus. And their boss, Hillary Clinton, has charged them to teach digital diplomacy to the world. Cohen, 28, and Ross, a decade his elder, were profiled this weekend in the NYT Magazine, and it's a fascinating look at two cutting-edge State Department employees who are as well-versed in Ustream as they are in Uganda. They are engaged in what they call 21st-century statecraft, a type of modern diplomacy that replaces inefficient bureaucracies and interdepartmental memos with strategic Twitter blasts and viral videos. The Text Haiti 90999 program that popped up after the earthquake last January? Cohen and Ross helped Mobile Accord get it off the ground. The Twitter service outage planned in the midst of the postelection protests in Iran? Cohen had it postponed. "What you did in Doha with the secretary," Ross said. "There's nothing to have kept us from Ustreaming that, and going from an intimate meeting with Farah Pandith, the secretary of state and 12 civil-society actors to something thousands of times larger." "What you need is a really good hash tag," Cohen said. After a moment everyone agreed that "#muslimengagement" was too long. "We don't have to come up with that right now," Ross said. "You have a body of great material. We ought to have somebody go through it and do grabs. Figure out over the course of whatever it is you've said, those things that can be encapsulated in 140 characters or less. Let's say it's 10 things. We then translate it into Pashto, Dari, Urdu, Arabic, Swahili, etc., etc. The next thing is we identify the ‘influencer' Muslims on Twitter, on Facebook, on the other major social-media platforms. And we, in a soft way, using the appropriate diplomacy, reach out to them and say: Hey, we want to get across the following messages. They're messages that we think are consistent with your values. This is a voice coming from the United States that we think you wanted to hear. So we get the imam. . . ."
Of course, there are those who are skeptical of Cohen and Ross's hash tag diplomacy. The two have close relationships with the titans of Silicon Valley, including Google's Eric Schmidt and Twitter Chairman Jack Dorsey, and many have cited the dangerousness of other countries perceiving Facebook and Twitter as official extensions of the U.S. Government. Caption Contest: "Why Aren&apos;t You Following Me on Twitter?"